The Phinisi, officially known as ‘Cheng I Sao’ is the sister boat to The Junk and offers fantastic dive itineraries in Thailand and Myanmar from November – May each year. Four different itineraries are on offer, varying from 4 to 10-nights in length. The Phinisi was custom built for divers, and the facilities reflect that. There is a shaded diving deck, personal set-up and storage area, as well as nitrox and quality Aqualung equipment available to rent. An SMB is also offered for use during the trip free of charge. Various itineraries are available in Thailand which explores the clear blue waters of the Similan Islands. Dive sites visited include Koh Bon, Koh Tachai and Richelieu Rock. The Phinisi also visits some of the best dive areas in Myanmar, including Black Rock, High Rock, Tower Rock and Torres Island. 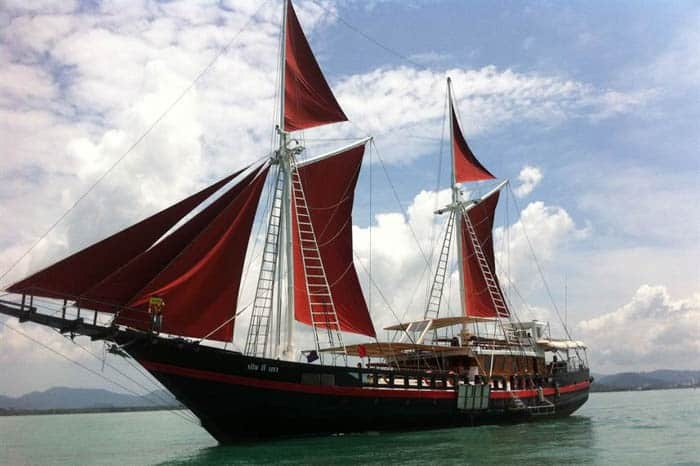 The avarage price for diving with this liveaboard is 213$ per day. We have done the research for you and found everything you need to know about The Phinisi - we found the best prices and we've collected reviews from other divers. The boat departs Chalong Pier Phuket in the evening on the same day.